50 years ago this year, Captain Kirk and his crew first appeared on small screens across America. The interstellar adventures of the Starship Enterprise quickly captivated audiences, turning the show into an iconic piece of television history. 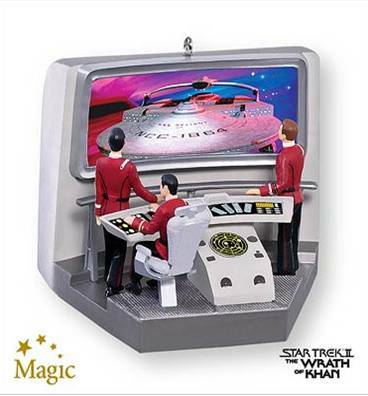 Press the button on the ornament to illuminate the scene and hear dialogue from the original Star Trek TV series! Unfortunately, this piece was scarce when it was released at the October 1st Ornament Debut. I was the first one in the door and there were none to be had except for those that had reserved the precious few ahead of time. I probably should’ve sprung for the Death Star Tree Topper as an investment purchase but that is a lot to ask of a Trek fan. 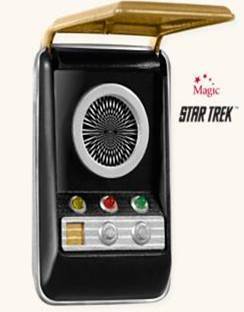 Press button to see scene illuminate and hear dialogue from original STAR TREK TV series. 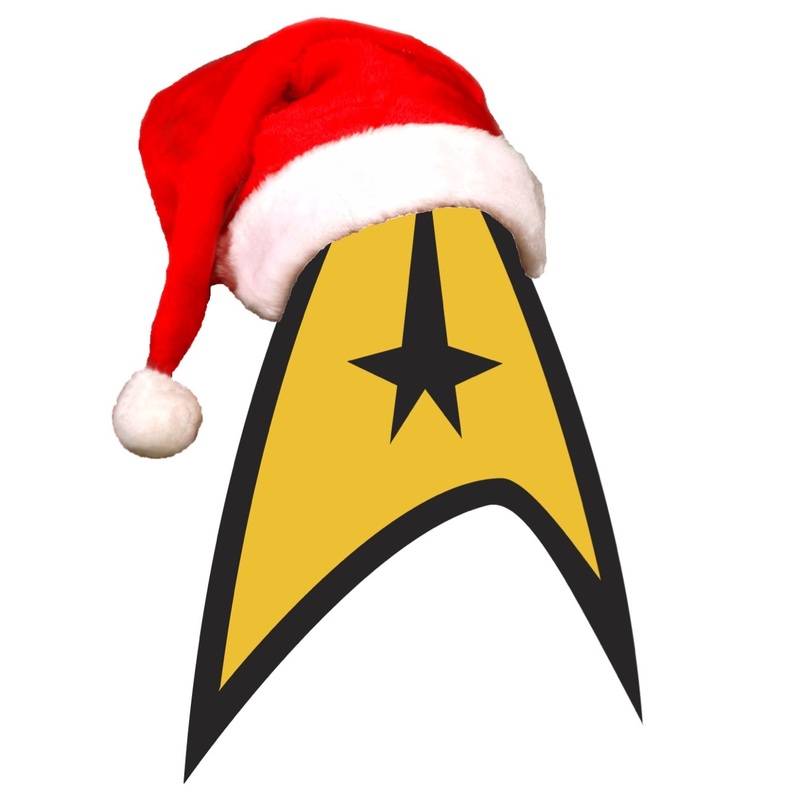 This entry was posted in 079) 2016 To Boldly Go, 2016, Battery, Kirk, Magic Sound & Light, Master List, McCoy, Ornaments by Artist, Ornaments by Character, Ornaments by Era, Ornaments by Pwr Source, Ornaments by Series, Ornaments by Theme, Ornaments by Year, Orville Wilson, Scenes, Spock, ST: TOS (TV) on July 9, 2015 by garfieldandtrump. Box Text: “Set phasers to stun.” Considering the alternatives, enemies of the Federation are lucky to hear this command from a Starfleet officer. 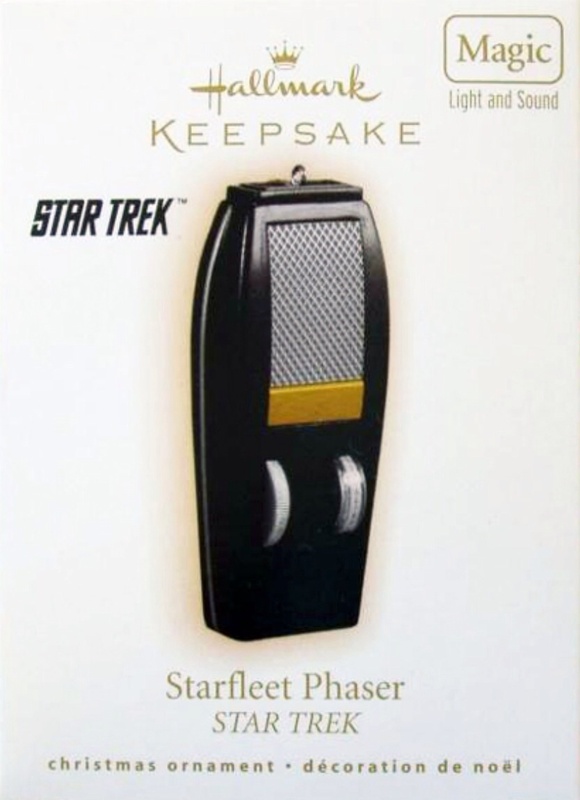 With additional settings that include overload, disintegrate, and kill, the phaser is the versatile – and powerful – standard issue weapon carried by Captain James T. Kirk and the crew of the U.S.S. Enterprise in the original STAR TREK television series. Since then, versions of the phenomenally cool phaser have appeared in almost every STAR TREK incarnation. 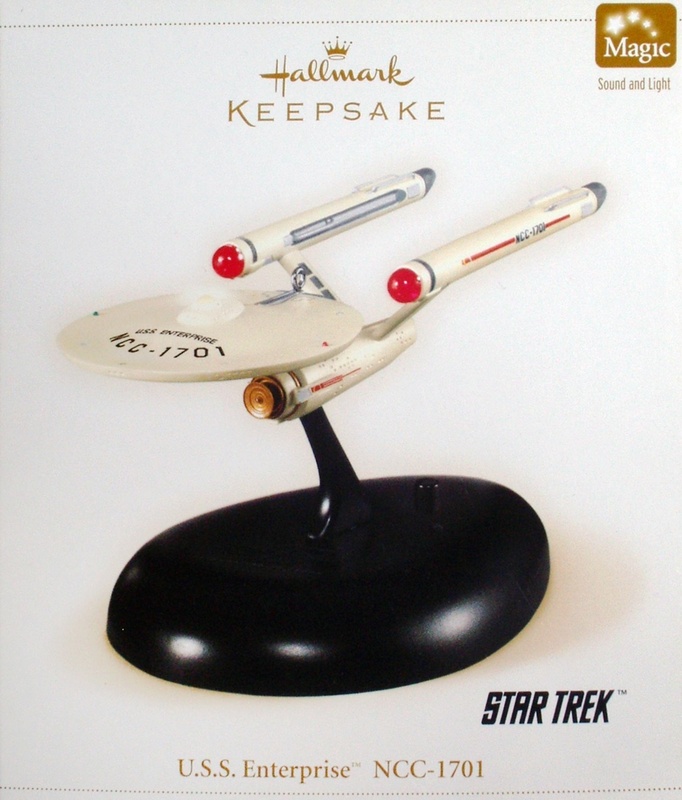 Now, with this ornament, STAR TREK fans can spend the holidays with phasers set on “fun”! This entry was posted in 052) 2009 Phaser, 2009, Battery, Magic Sound & Light, Master List, Props, ST: TOS (TV), Uncredited on October 24, 2011 by garfieldandtrump. Logic or loyalty? 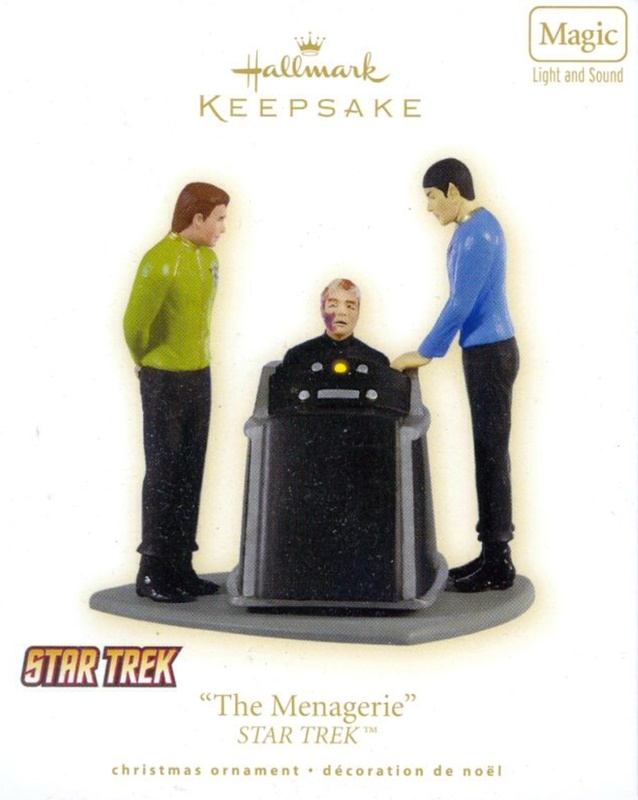 Spock remains true to both in The Menagerie, a Star Trek original series two-parter from 1966. Written by series creator Gene Rodenberry, the award-winning episode incorporates pre-Kirk footage from an unaired installment that was originally set to be the pilot episode. Spock and Kirk find themselves at Starbase 11, where they meet Spock’s previous captain, Christopher Pike. Now burned and paralyzed from an accident, Pike can no longer walk or talk. Communicating with flashing lights controlled by his brainwaves, he can only answer yes or no, and Spock in the only one who can help him! His predicament and the mutinous lengths to which Spock will go for his former captain and friend lead to one of the series’ most well-known adventures. 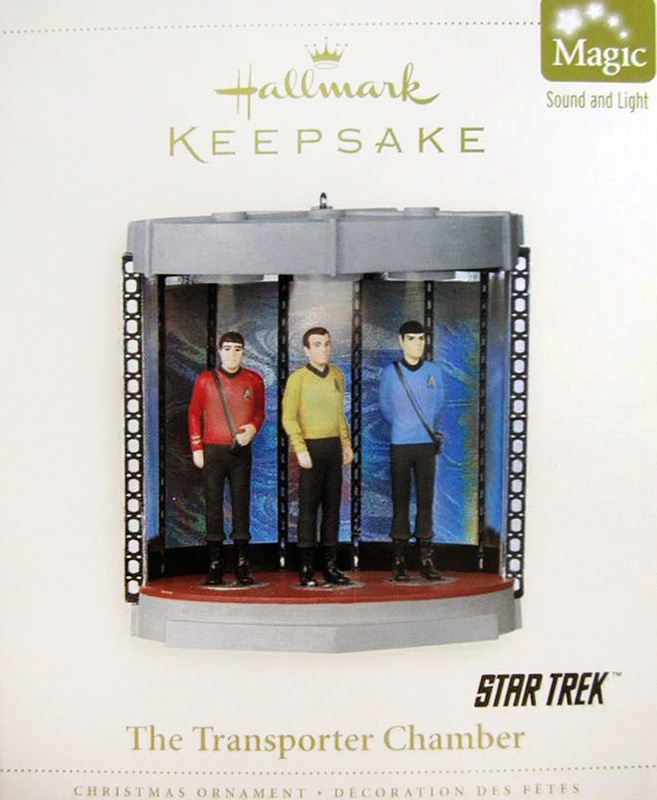 Press the button on the ornament to hear Spock and Captain Kirk speak and see Captain Pike’s light flash. This entry was posted in 051) 2009 The Menagerie, 2009, Anita Marra Rogers, Battery, Kirk, Magic Sound & Light, Master List, Pike, Scenes, Spock, ST: TOS (TV) on October 24, 2011 by garfieldandtrump. If you had to invent a futuristic communications device, what would it look like? decades before flip phones beacame commonplace, the visionary prop artists of STAR TREK created the convincing, portable, and highly desirable method for 23rd ceturay Starfleet crew members to keep in touchwith each other. Its transmissions could cross great distances, and its functions included a locator that anticipated today’s GPS. 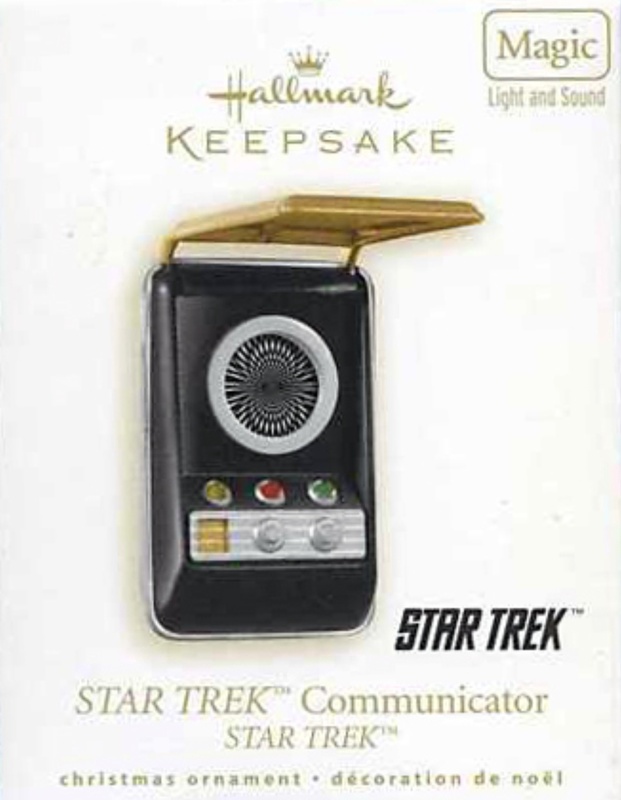 Open the lid and press the buttons inside to the lights flash and hear portions of actual communicator conversations form the original STAR TREK television series. This entry was posted in 048) 2008 Communicator, 2008, Battery, Magic Sound & Light, Master List, Props, ST: TOS (TV), Uncredited on October 24, 2011 by garfieldandtrump. Box Text: A routine cruise turns deadly when the U.S.S. Enterprise is prematurely pressed into service to protect the secret “Project Genesis” experiment. 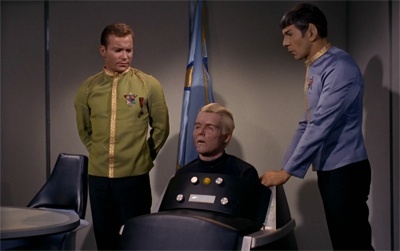 Responding to an enigmatic call for help, Captain Spock offers his ship and eager but inexperienced crew to veteran commander Admiral James T. Kirk. Together they face an old enemy, Khan Noonien Singh, who lures Kirk into a battle of revenge. Khan is defeated, but not before unleashing the experimental Genesis Device, creating new challenges for the future of the Federation. 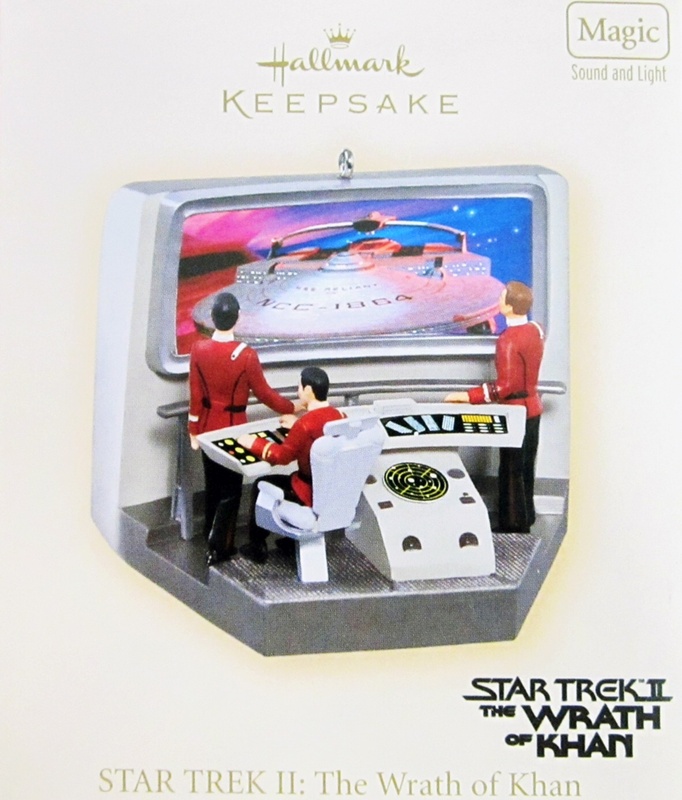 Press the button on the base of the ornament to activate the sights and sounds of an epic battle scene from one of the most action-packed STAR TREK films ever! This entry was posted in 045) 2007 Star Trek II, 2007, Anita Marra Rogers, Battery, Kirk, Magic Sound & Light, Master List, Scenes, Spock, ST: TOS (Films), Sulu, Wrath of Khan on October 24, 2011 by garfieldandtrump. 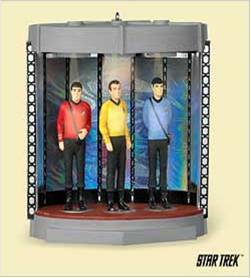 Aboard the USS ENTERPRISE NCC-1701, Captain Kirk, Science Officer Spock, and Chief Engineer Scott enter the transporter chamber. The crewmembers are then converted into a beam of energy and reasembled in another location to begin their mission. No Starfleet vessel leaves spacedock without one. This entry was posted in 043) 2006 Transporter, 2006, Anita Marra Rogers, Battery, Kirk, Magic Sound & Light, Master List, Scenes, Scottie, Spock, ST: TOS (TV) on October 24, 2011 by garfieldandtrump. A flagship of Starfleet, U.S.S. Enterprise NCC-1701 embarked on its historic five-year mission in 2264. Commanded by Captain James T. Kirk, the STARSHIP ENTERPRISE transported us to the final frontier for unparalleled adventure. During their exploration, the ship and crew introduced us to life on new planets and unimaginable technologies. As an ambassador for Earth and the rest of the United Federation of Planets, the ENTERPRISE gave us an inspiring vision of the future. To see this ornament come to life, place it on the included display stand. Press the button on the back of the stand to hear the theme song from the original TV series and see various lights on the ship illuminated. The lights will automatically turn off after 20 seconds. Battery operated. Batteries not included. This entry was posted in 042) 2006 Enterprise, 2006, Battery, Display Stands, Ent. 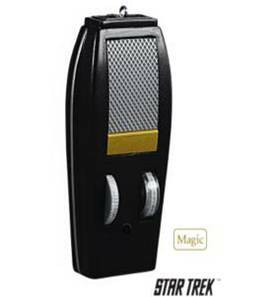 NCC-1701, Lynn Norton, Magic Sound & Light, Master List, Ships, ST: TOS (TV) on October 24, 2011 by garfieldandtrump.